I was in a little gift souvenir shop a couple of weeks ago and came across a little card that really got me energized. It was from a company called quotablecards (www.quotablecards.com). 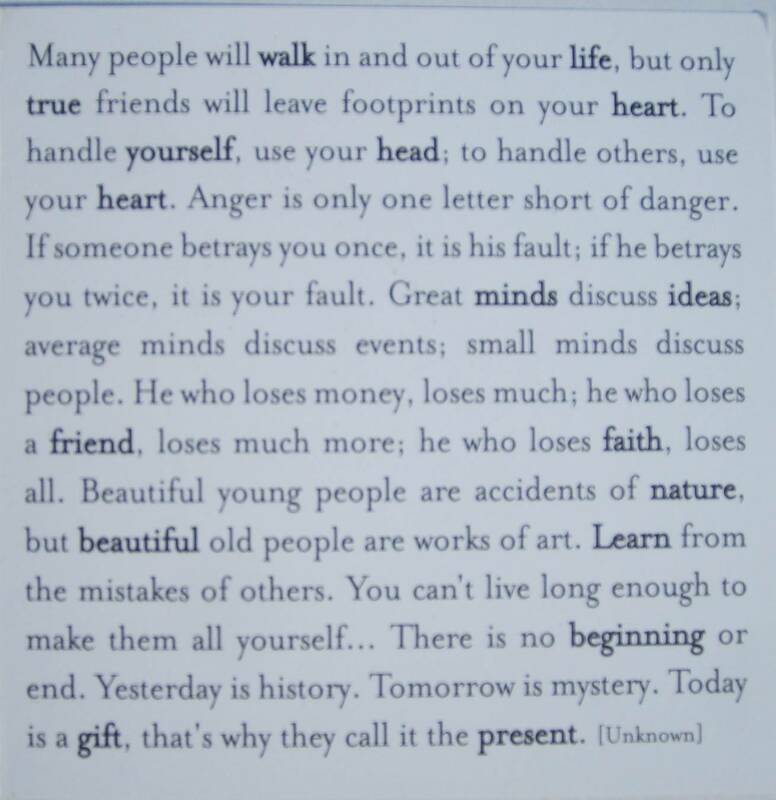 On the cover of the card were a series of quotes that spoke to life in general, a number of which really sparked me. It got me wondering why do we so much value quotations, what about them inspires us, causes us to smile, nod with understanding or maybe makes us set our jaw firm and determine to do better / different /more. It seems that some quotes just cause a great emotional response. “My name is Inigo Montoya” . Don’t movie quotes just cause a smile to jump to your face or maybe another one causes a tear to form in your eye or your heart to warm slightly or it makes you want to turn on a nightlight. Five words can bring an emotional rush. It’s like a small key opening a big room. Quotes can serve to steady your ship in the midst of the chaos going on around you, reestablish your focus and get you back on the path. “Darkness cannot drive out darkness; only light can do that. Hate cannot drive out hate; only love can do that.” I think it is often that we need gentle reminders we are part of a larger community. And lastly, quotes also teach us / remind us / hit us along side the head with a two by four about the larger things that we forget about while we are involved in the day to day to day to day minutia that is our lives. “For God so loved the world, that he gave his only Son”. I should tattoo that one to the inside of my eyelids. I love quotes. They are like vacation photographs that say so much more than what is visible in the picture. “Great things do come in small packages”. ← I love you guys! !